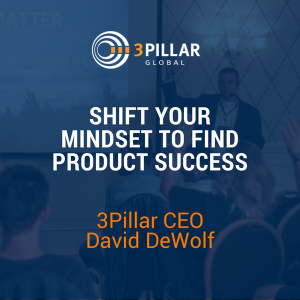 3Pillar CEO David DeWolf spoke on the importance of seeing software development through the lens of product at the recent “Product Matters” event in Iași, Romania. Titled Shift Your Mindset to Find Product Success, David’s talk describes his journey from independent software developer to CEO of a 900-plus person software development company. To illustrate the importance of viewing development through a product lens, David tells the story of 3Pillar’s first client, ServiceBench. ServiceBench was a company that on the one hand was disrupting the claims processes of major manufacturers like Kenmore and Whirlpool, yet on the other hand was having difficulties innovating on their own product and getting new releases to market in a timely manner. You can watch the full video of David’s presentation via the YouTube embed below. David DeWolf is the Founder and CEO of 3Pillar Global. In this role he has guided 3Pillar to a leadership position in the Product & Digital Development Services sector, establishing 3Pillar as the go-to innovator for content, information, and data-rich companies looking to grow revenue through software. David is passionate about software product innovation, entrepreneurship, and principled leadership. In 2012, David was named one of SmartCEO Magazine’s “Future 50.” In 2011, he was recognized by the Washington Business Journal as one of “40 Under 40” who are Washington, D.C.’s brightest young business leaders. “Product Matters” was the first 3Pillar tech event in Iași, Romania, and it coincided with our office opening in Iași. The event saw a number of talks from 3Pillar executives and product leaders on recent technology trends, the value of learning the Product Mindset, understanding how teams can work together to compete and win in the digital economy, and more. If you like David’s take, please help us spread the word about his talk! How can someone pass and make whole team understand same? there are people with different mindset and work skills, they only think of their role not whole product.